Soak moong dal for two hours and then grind it and keep aside. Heat ghee in a pan and put the moong dal in it. Saute on low flame till it turns golden brown and leaves a distinct aroma. Remove from the flame and set aside. Heat water in a pan, add sugar and boil the mixture till sugar melts. 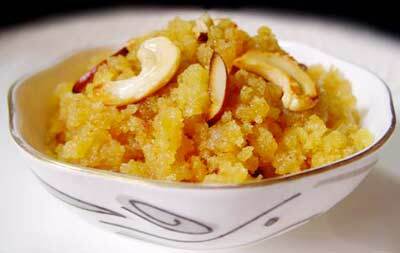 Remove moong dal ka halwa from the flame and decorate it with chopped dry fruits. Serve.